I came across the newspaper article in The Star- Trim with Ease- a new method to trim down espouses a nourishing diet and a healthy state of mind (1 October 08). The method was designed by Jon Gabriel, who weighed 187kg and now he had trimmed to 83kg (height 1.9 metres). He mentioned that he had tried all sorts of weight loss methods such as low fat/low carb diets, naturapaths, homeopaths, personal trainers and even had acupunturist tape seeds to his ear- but none of them worked. Finally, he had succeeded because he understood the deeper underlying reasons. He states that our mental and emotional stress causes much of the fat gain- something that never got addressed by the more popular diets. 1. We need to nourish our body with nourishing food- then the nourished body will not demand for fattening food. Instead, it will crave healthier food. 2. He recommends lots of greens, organic produce, drink plenty of water, proteins (from grass fed meat, free range chicken, whey protein). 3. He suggests method to overcome the deeper underlying causes (mental/emotional stress/toxins and devitalisation) by adopting methods such as visualisation. 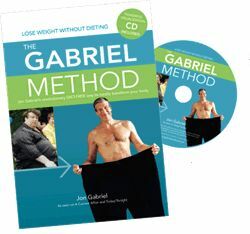 The Gabriel Method is gaining popularity because Jon addressed one of the main issues that got to do with failure of diets- the diets either address the body’s biochemicals without focusing deeply into emotional factors, and stressors of daily live. Agreed- a lot of the books there tend to ‘blame’ bad foods such as food high in sugar, fat, carbs, etc- and there are tonnes of recipes- but there’s probably few small chapters devoted to maintaining the real motivation. That’s why most of these diets do not work long term. What he actually did is that he combined all factors to increase the success- nutrition, mental wellness and probably throw in some ideas from ‘The Secret’ and ‘The Law of Attraction’ into the plan and repackaged it as a new method. Basically, anyone who had lose weight and managed to keep it off for good would have addressed and overcome emotional factors pertaining to overeating. He provide a balance between the popular diet books and methods of ‘think yourself thin’ which had already been populated by many other authors. But it is no denying that he succeed through the old fashioned way- sensible eating and exercise. The fact that he works out is very evident in his body- and for anyone wishing to maintain weight loss long term- exercise has to be a bit part of the plan. Everyone of us is really very different. Ask anyone who kept the weight off for years- and they will tell you that they improvise based on an existing method. Initially when you had to struggle with overeating- you will need to find a plan that suits you- then modify it according to your lifestyle as you go along. You are unique- so you need to customise a lifelong healthly eating plan. If you follow other people’s thoughts and ideas, you will probably fail because one works for someone will not work for you. That’s why there will be many more of such books being churned out in the market and they will continue be demands for this type of books. The reason is simple: someone tried it and succeeded in losing weight. Then, he/she introduced the method used (normall adapted from other programs out in the market) to the entire world. And everyone rushes to buy it after seeing the ‘before’ and ‘after’ photo. Personally, I had started off with Sugar Blues/Sugar Busters, then Carbohydrate Addict, then Glucose Revolution, and also read books like ‘Mindless Eating’ that go into the deeper underlying reasons of overeating. In the end, I was successful because I had to customise to suit my own needs and lifestyle. After going to one big circle- I find myself arriving back at the basic fundamentals of weight loss- EXERCISE + MODERATION IN FOOD. Today, I ate whatever I like. You can check out reviews of other diet plans here. Just like to say that your post is the most sensible thing I have EVER read regarding weight loss. Gotta agree with you there. Exercise and moderation. Agree! 100%. Never blindly follow other people’s recipes. Get your own. See this article about losing weight by seeing the big picture.